Hi Friends! Happy Monday! I hope you had a great weekend! I spent the majority of mine restlessly searching for a paint color for our master bedroom. Let's just say, my middle name should be 'Indecisive'. I tried and tested thirteen different colors on the wall, before I committed to a final decision at 3:00 in the afternoon on Sunday; Benjamin Moore's 'White Sand'. The rest of that afternoon, evening, and night, was purposefully spent coloring the walls. And after all the searching, after all the effort, after all the paint in my hair and in my nails, I'm pleasantly surprised with the results. Our room looks, and more importantly feels, fresh, bright and slightly modern. I asked Husband what he thought, in which he replied, "It looks like the sand on the beach in Costa Rica. Or a cloud." Pleasantly, I smiled with satisfaction. I'm a true believer that color effects the brain. So, when I woke up this morning, I couldn't help but feel comfy, refreshed and at ease in our white bed, with our sandy white walls, and the beautiful sunshine cracking through the windows. What a beautiful outfit! I love the simple elements but that it makes a statement with bold color. This outfit is perfect for Spring! Glad you found a wall color of your choice- sometimes those decisions can be so daunting! You did good, it took me 2 weeks to find a color for my room, ha ha. 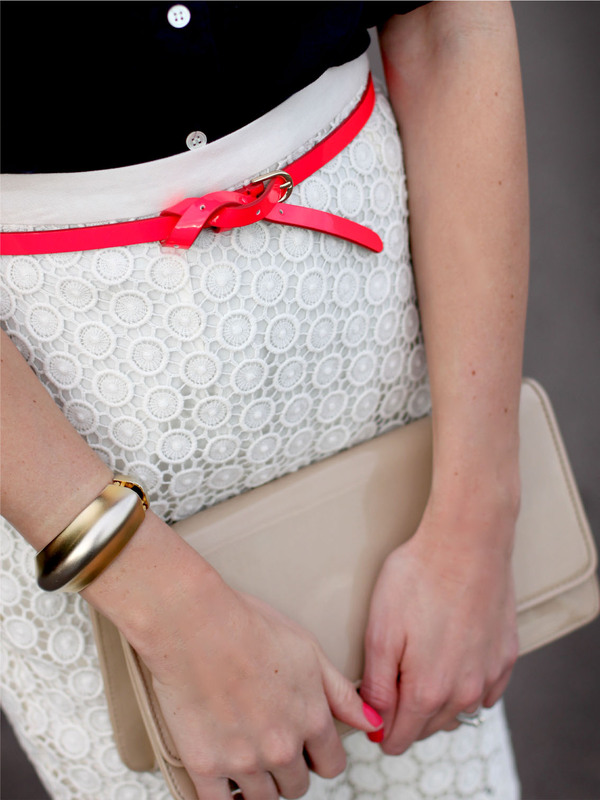 Love this outfit and the pop of red and how the clutch matches the shoes. OMG! Those shoes are AMAZE!!!!!!!!! That sounds so peaceful. It almost reminds me of your skirt, which is adorable. Look at your shoes, I LOVE THEM!!!! The first picture is absolutely stunning! I just love the lighting. Great shoes too! Love that description of waking up in your newly painted room. Somewhere on the World Wide Web I saw that same paint color mentioned...maybe Apartment Therapy? In any case it must feel awesome to have a refreshed room. I need new bedding and can't wait to go for something different like ikat...or block print. p.s. how are you not a model?! Stunning! Beautiful spring look! Very classy, love the pink accents! Love this outfit, especially the bright belt, and you look gorge! Hooray for your new wall color! Sounds like it was a success! I love love LOVE your skirt! Searching for a paint color is a major pain in the a$$. After designing several homes, I still am indecisive when it comes to paint. The best advise I can give is don't rush it. Get some samples and let them sit on your wall for a week. See what they look like in the the morning, noon, and night. This look is so very polished! Love this look... I may need to go get a white lace/crochet pencil skirt! I'm glad you've found a suitable color for the bedroom... I agree that color really affects your mood. that skirt is just beautiful and they way you paired it with everything else is just perfect in my books!! Best skirt ever. Love it. The shoes are great too; it brings everything together. Love love love. Love the pop of color!! So classy! Gorgeous as always. You made me look around my room and want to paint it. Unfortunately, i don't own this room and won't live here long. haha! I found you via Karen Kane's facebook... and just wanted to say you totally look like a model! Yeah I am totally indecisive too! That would be me with the paint color! But I'm glad you found a color that you love. cute outfit! so chic & slick! that skirt is adorable! Those shoes are amazing. As is this entire ensemble. love this outfit!! you look lovely! Perfect color choice. I love painting the walls like that and using rich color to decorate. My blog tomorrow is a look into my home showing that. I am absolutely in love with this whole outfit... the pink belt gives it such a glam touch. Ahhh horray for the newfound ambiance in your room. I agree with how we react to color. It's awesome that the color resembles something so peaceful to you and the hubbs, too! Love this look, looks like it was a beautiful day...where was I all day?! haha. I love your heels, great skirt, too. You look adorable. Loved your outfit and style! I love what you're wearing! You've put everything together marvelously! True, colour around us is so important. Glad you got what you wanted on the walls! I love this look! I'm a huge neon fan right now so the belt is something I'm running out to Ann Taylor to purchase asap! Love your nail color too! love the pops of color in a subtle way! cute! That skirt is absolutely gorgeous and I love the pop of color the belt gives to the whole look! LOVE this look! Love the shoes, I want to find those! Um LOVE those shoes - they are fantastic! I am soo indecisive too!! It took me 2 weeks to pick a color for out living room. And then we ended up repainting it!! So cute and very classy...love those shoes!